Innovation is about looking beyond the existing. Challenging the status quo. Develop the best solutions beyond borders and for maximum value for everyone. DB Schenker is one of the leading providers of Road and multimodal transportation in the world. Since 1872, when Gottfried Schenker commenced his business with a single truck until today, with over 140 years of delivering logistics solutions, DB Schenker leads in providing reliable transportation services. The consumer markets in Southeast Asia continue to grow. In a recent article on Online Retail in Southeast Asia, Research Institute Forrester commented that it expects the B2C online retail to reach $53 billion by 2023 from $19 billion today. Due to the growth of the consumer markets and, consequently, the household spending in Southeast Asia, more goods will need to be moved across borders. This has given a healthy boost to the cross-border trucking business in the region. Cross-border trucking can save you money and time. Depending on the cargo and the destination, it can be faster than ocean transport and cheaper than air freight. It’s also a more flexible option as it allows for new transport routes between neighboring countries or regions and fast door to door delivery. With air freight and ocean freight you rely on fixed schedules of the airline and shipping companies. With trucking, on the contrary, you can be much more flexible about the route and departure times. In this article, Arjun Kohli, Head of LANDbridge for the Southeast Asia Cluster, shares information on cross-border trucking and provides tips on how to make the land border crossing process for your shipments as smooth as possible. What are the busiest border crossings? Some of the busiest border points for cross-border trade are the Thailand and Malaysia border with Sadao (TH)/ Bukit Kayu Hitam (BKH) (Malaysia) and Sadao (TH)/ Paedang Besar (Malysia) as the two main border points. Another busy border point is the Pingxiang (CN) / Langson (VN) border between Vietnam and China. Finally, Johor (MY) and Tuas (SIN) between Malaysia and Singapore and Aranyaprathet (TH) and Poipet are amongst the most busyies borders in the region. 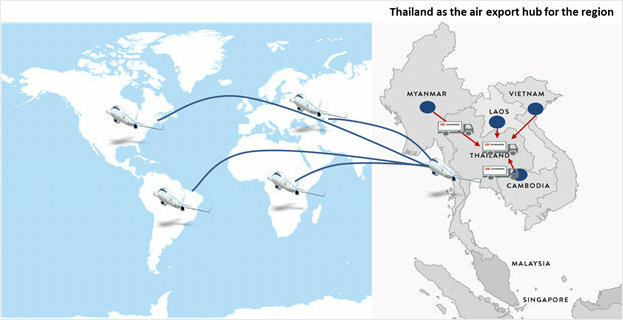 Besides the four borders above, we also see increased trade between Thailand and Myanmar. What do I need to know before organizing my first cross-border shipment? Cross-border trucking as a transport mode in Asia has many benefits. However, to ensure a smooth process, Arjun mentions a few things you should know before organizing your first shipment. Firstly, vehicle restrictions bar entry of one country’s cargo truck into the other. Unlike in the EU, where trucks can easily cross borders, commercial vehicles in Southeast Asia, registered in one country, cannot enter the other country. For example, Malaysian trucks cannot enter Thailand and Thai trucks cannot enter Malaysia. Likewise, Chinese trucks cannot enter Vietnam and Vietnamese trucks cannot enter China. There are two exceptions. Firstly, in Laos, where trucks from both Vietnam and Thailand can enter. Secondly, in Singapore, where Malaysian trucks are allowed to enter Singapore. The vehicle restrictions require additional handling because the cargo needs to change trucks at the key border points. DB Schenker overcomes these challenges by implementing efficient crossborder security procedures. Our cargo damage rate is less than 1% and we ensure the smooth daily transport of cargo across borders for many of our high-end customers in the consumer electronics, telecom and FMCG sectors. A second key area that makes cross-border trucking different from other transport modes like ocean and air, is the difference in customs requirements. 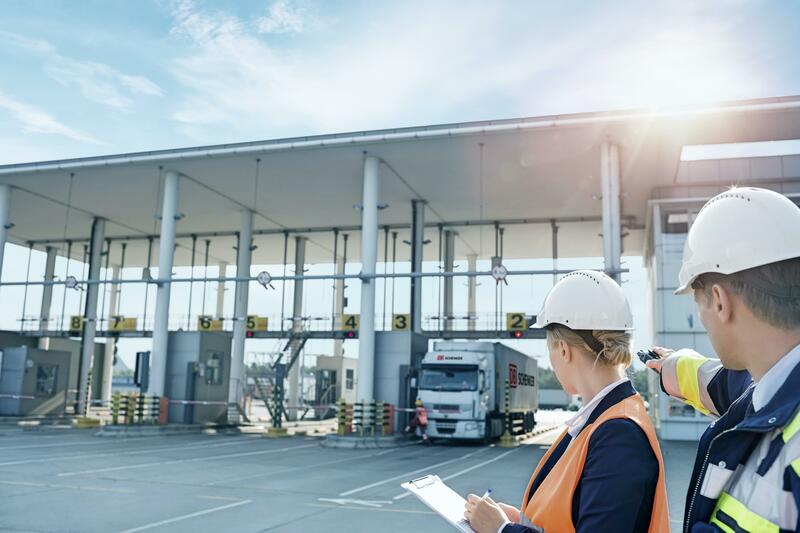 Although the countries work on initiatives to put a coherent customs process in place, shippers have to deal with multiple customs requirements when crossing the border. Most of the customs process is like other freight modes, such as air and ocean. However, the road borders are often far removed from the regular country entry points, like air and sea ports in the main cities. Due to the remote locations of the road borders and the fact that most customs headquarters are located in the city, it can take a long time to resolve issues like incomplete paperwork. To avoid delays and costs, it is important to work with a well-established, international logistics company. Unlike domestic trucking companies that operate on a small scale and do not offer integrated services like customs clearance, DB Schenker has offices at most key road border points with specialized customs teams in each of the Southeast Asian countries. This ensures that the shipment complies to all customs regulations before the truck departs for its cross-border journey. With an established cross-border provider, the shipper can also use secure storage and parking facilities at the key borders in case of unforeseen delays. The peak seasons are a third key area that you need to be aware off. At specific times throughout the year, certain border crossings deal with exceptionally high volumes resulting in long waiting times for the shippers. This happens for example around the Chinese New Year, or at month end closing when some industries push out more cargo than usual. Besides longer lead times, shippers may have to deal with a lack of truck availability and manpower because drivers may not always come back to work straight after the holidays. To avoid problems during peak times, we recommend Southeast Asian companies to work with an experienced partner. International logistics providers, like DB Schenker, know the local market conditions and are better at forecasting traffic flows. They also partner with other trucking companies to efficiently manage demand fluctuations. A last key area is cargo security. Cargo security is essential for all transport modes. However, the road conditions in Southeast Asia are especially challenging. Luckily there are steps you can take to make sure your cargo stays safe. To avoid damage to the cargo, make sure the cargo is properly secured with lashing or floor stoppers or install special air bags. Also verify if the driver is thoroughly trained to deal with tougher road conditions. Trucking is not only an efficient transport solution across Southeast Asia. Increasingly, shippers discover the benefits of multimodal solutions for export or import to and from other regions in the world. For instance, at DB Schenker, cargo is transported from Vietnam to Bangkok via road for various customers, and once it arrives in Bangkok, the cargo is shipped by air to East Asia, Europe and Latin America. This multimodal solution is also attractive for cargo from other countries, such as Cambodia, Laos and Myanmar. 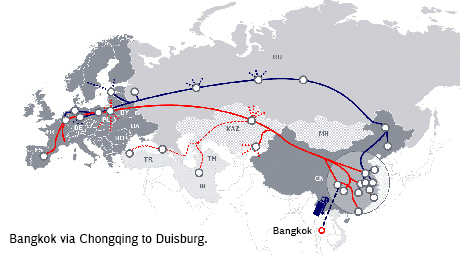 Another attractive multimodal transport solution is by road/rail between China and Europe. With the increased frequency of rail between various cities in Europe and China, rail is quickly becoming a more attractive option for shipments between Asia and Europe. For several of our Southeast Asian customers, especially in Thailand and Malaysia, we now move cargo by truck to cities like Chongqing in Southwest China. From Chongqing, we transport the cargo by train to the various cities in Europe. This trucking-rail solution can save you time and costs, and it also reduces carbon emissions. What makes a shipment successful? Finally, we asked Arjun what makes a cross-border shipment successful. In his experience, heading the LANDbridge team for Southeast Asia, the key success factor is timely planning, effective communications and strong implementation. “For every new customer, we prepare a standard process document with the lead time performance expectations. how we communicate about specific milestones. Timely planning becomes even more important around public holidays or during peak season. In these circumstances, careful planning is crucial to avoid last minute surprises. A final success factor, says Arjun, is to work with experienced and committed staff. Cross-border shipments involve a lot of coordination amongst the teams in the different countries. The local teams need to communicate well, have the same goals and show the same level of commitment towards the customer. The Schenker transportation and customs brokerage teams in Southeast Asia know each other well. We have regular meetings to exchange ideas and discuss ways to further improve our services. 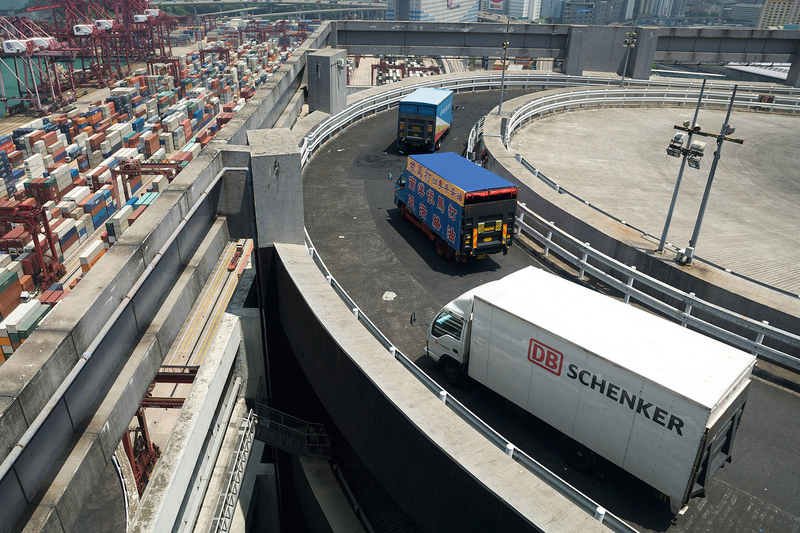 With Asia LANDbridge, DB Schenker has one of the most extensive cross-border road transportation services available in Southeast Asia, with access throughout Singapore, Malaysia, Thailand, Cambodia, Laos, Vietnam and Myanmar and we offer an excellent connection to China. More information is available on our website. 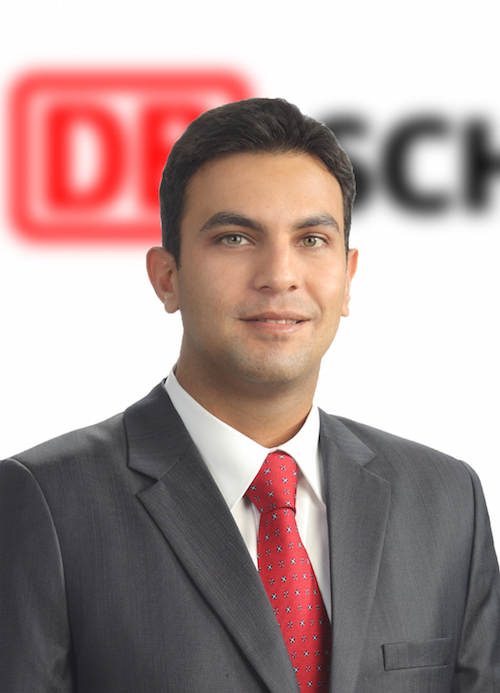 To learn more about DB Schenker’s cross-border trucking solution in Southeast Asia or to book your next shipment, please contact Arjun Kohli (email: arjun.kohli@dbschenker.com) or your local DB Schenker office.